Yes I saw those too but they were more basic with less colors, choice & smaller designs. Yes I saw those too but they were more basic with less colors, choice & … Yes I saw those too but they were more basic with less colors, choice & smaller designs. My hubby must have about 10 pairs of Simpsons,family guy etc socks brand new in the cupboard - as does my brother-in-law.All of which have been Christmas pressies over the years. I was just wondering does anyone atcually wear them, or do they just hibernate or become a recycled gift? 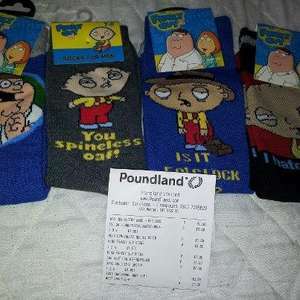 My hubby must have about 10 pairs of Simpsons,family guy etc socks brand … My hubby must have about 10 pairs of Simpsons,family guy etc socks brand new in the cupboard - as does my brother-in-law.All of which have been Christmas pressies over the years. I was just wondering does anyone atcually wear them, or do they just hibernate or become a recycled gift? Are your other socks in the wash?